Lambda Technologies has developed a solution to extend fatigue life and improve damage tolerance of compressor blades in the CFM56-7B and F402-RR-404 engines. Using low plasticity burnishing (LPB®), Lambda engineers apply a deep, stable layer of designed residual compression to the dovetail region of the blades. By putting the edge of contact region in compression much deeper than the shallow shear cracks formed by fretting, fatigue cracks cannot propagate through the compression and the chance of fracture is eliminated. When applied to a blade with existing fretting fatigue damage, LPB provides better than 10x life improvement over that of a brand new blade. Considered one of the hardest working jet engines with excellent support from the OEM, the CFM56 family of engines power more than 13,400 commercial and military aircraft worldwide. The F402 engine is employed on many varieties of military aircraft and is considered the powerhouse for the AV-8B Harrier II jets. The engineered use of beneficial residual compression represents a modern way of thinking about aircraft design and maintenance support. Because LPB doesn’t require any changes to the material or existing design of the part, LPB applications are FAA sanctioned alterations of original components and do not fall under the Parts Manufacturing Authority (PMA). The FAA has issued a Supplemental Type Certificate (STC), number SE03036CH, for LPB processing the Stage 1 High Pressure Compressor (HPC) blade dovetails of the CFM56-7 series engines. Designed compression has been proven to successfully improve component life and performance, and is already in production on many aircraft applications, including blades, vanes, disks, bladed disks, landing gear, and structural components. “The time and money that could be saved by implementing LPB is astounding. It’s encouraging to see more and more overhaul applications, but it’s even more exciting that a number of OEMs have started including it in the initial design phase of components. With LPB, planes are in the air longer and cost less to maintain,” says John Cassidy, Quality Assurance Engineer at Lambda Technologies. 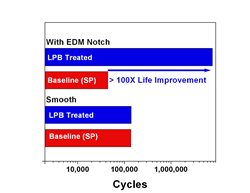 Lambda Technologies is an innovative company incorporating a premier materials research laboratory with a world-class engineering and production enterprise dedicated to the development and optimization of surface treatments to improve component performance. For additional information on Lambda Technologies or the LPB process, contact Julie Prevéy at (513) 561-0883 or visit http://www.lambdatechs.com.